We hope you would like to join the Beltzville Flying Machine Society. To join just print our membership application (PDF), fill it out and mail it in with a check made payable to BFMS. New members pay a one-time $12 initiation fee plus $3 per month for the remainder of the calendar year. For example, a new member joining in May would pay $36; $12 initiation fee plus $24 for the eight months of May through December. Renewals for adult members are $35 per year. Membership for junior members is $12 per year. Membership for additional family members is $12 per year. 2. No spectator is permitted beyond the designated spectator area. 3. Each pilot, on arrival at the field, shall place his transmitter in a safe place, designated by Society, and secure from the general public. 5. The use of frequency control pins is mandatory, the appropriate pin be affixed to the transmitter for any testing or flying activity. 6. The starting of engines shall be restricted to the flying field or designated starting area. 7. Pilots and guests on the flight line shall have AMA membership. Exception to this is students covered under the intro pilot program. 9. Pilots shall avoid passes over the set-up, spectator and parking areas. Flying which is dangerous will not be tolerated. 10. Upon completion of each flight, pilots shall return their equipment to the set-up area by the shortest, safest route. Taxiing shall be limited to the taxi-way and no taxiing may be continued into the set-up area. 11. All users are responsible for maintaining the designated premises in a neat and orderly condition. 12. All Aircraft are subject to inspection by the Field Safety Director or his appointed helpers according to the attached Minimum Standards of Aircraft Safety. Q. I want to fly an R/C model airplane. How do I start? A. Most hobby stores selling R/C equipment post lists of area clubs. R/C magazines may also have listings. If these sources do not work out, write the Academy of Model Aeronautic at 5151 E. memorial Drive, Muncie, IN 47302 or call (800) 435-9262. 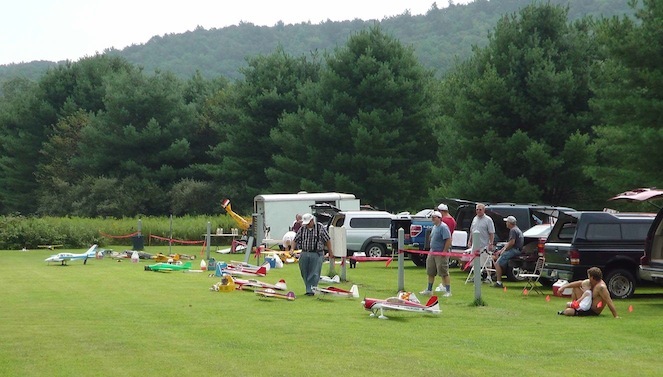 You can also go on line at www.modelaircraft.org for a list of clubs in your area. Once you have located a club, visit the field and ask lots of questions. The people there will be more than happy to help you get started. A. Like any new hobby, there are initial start up costs associated with Radio Control. The initial costs may seem high to the newcomer, but once you are established with a model and support equipment, the costs stabilize and can be as little or as much as you want to spend. Engines and radios last for years and with a little maintenance, they rarely wear out. You can transfer your engine and radio equipment from model to model as you advance. You can bypass the model building stage by buying an ARF – Almost ready to Fly plane that is nearly completely built structurally, needing only final assembly and installation of the radio gear and engine. This will cost a little more but you will not have to buy the building supplies and tools so that the cost ends up being about the same and you can be flying much sooner. As an alternative, a new generation of small electric powered small planes called Park Flyers has come onto the scene in the last few years. These planes can be purchased as complete setups (radio, battery, motor and plane) for between $100.00 and $200.00. The drawbacks are that because of they are smaller they can be harder to see at a distance and do not fly well on a windy day. Because they are electric, they are quiet and can be flown in more public places such as parks, hence the name Park Flyers. Q. Can a beginner teach himself/herself to fly R/C? A. Although you can learn to fly yourself, it is recommended you find an instructor to teach you for a couple of reasons. Learning to fly can get expensive and frustrating fast if you crash several planes learning to fly. Also, you are a safety hazard until you learn to maintain control of your airplane. Q. Why do I need an instructor? A. An instructor can help you in several ways. He can check your plane to make sure it is performing properly before you try to fly it. When a new R/C model takes off for the first time, there is no knowing how it will behave- some models will want to dive - others want to climb. They may also want to go right or left. There is nothing wrong with the plane in most cases, but these minor differences must be “trimmed out” so that the plane flies properly and an instructor is the best person to do this since he can anticipate and react to the plane’s movements. After the plane is trimmed out, the instructor can fly the plane to a safe altitude before turning the plane over to you. This will give you room in case you make a mistake and will give the instructor tome to save the plane before it crashes.